In 2018 it was reported that 74% of the UK felt too overwhelmed or stressed to cope. That is nearly three-quarters of the entire nation that have suffered from the physical, mental and emotional symptoms caused by stress. Although this sounds concerning, this figure could offer some reassurance to those feeling the same way as being overly stressed is extremely common across the UK . Stress can derive from a variety of issues, from work life, family, social media pressures, personal appearance and health, and affects people of all ages who hold anxieties that differ from generation to generation. Protectivity has conducted a survey to find out the stress levels of residents across the UK, finding out the main causes of stress, the most stressed generations and careers, and finally the all-important activities and remedies to help tackle these feelings and feel as zen as possible as a result. You can view the graphic here. The Welsh capital, Cardiff came out as the most stressed city with a staggering 55% of its residents claiming they feel extremely stressed on a daily basis. Close behind is Edinburgh and Manchester, both having 53% of people feeling stressed. These figures really highlight how the nation is feeling up and down the country and flags the efforts we need to put in to combat these figures. The least stressed city revealed was Newcastle and interestingly the notoriously fast-paced and busy capital, London came in as the 10th most stressed. Will you be relocating to live a more stress-free life? Does stress affect men and women in the same way? Our results show that there are significant differences between the stress levels of women and men and also what they stress about most. When analysing people's main causes of stress in the UK, women ranked most stressed in all areas other than work. Men and women’s top cause of stress came out as money-related issues, with 57.9% of women feeling like this and 51.6% of men. Interestingly, nearly double the number of women felt stressed about their personal appearance. Just 10.5% of men felt stressed about this issue, whereas for women this figure hit 20.3%. Work-related stress is one of the most common causes of anxiety across the nation, with 35-44-year-olds worrying about this issue the most. Men feel more stressed than women about work with 40.5% claiming to be stressed and 37.1% of women. HR comes out as the most stressed industry in the UK, which comes as no surprise due to the sensitive topics they handle on a daily basis from disciplinaries, legal compliance, and retaining employees. 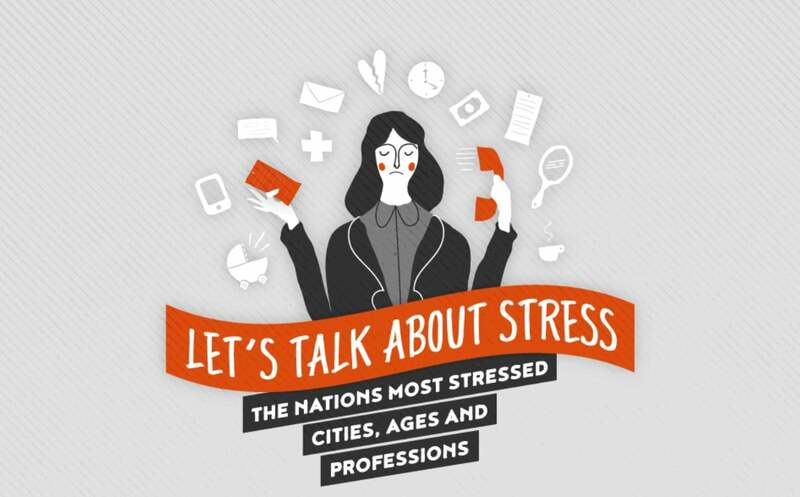 Other industries that come as no surprise as the most stressed include Legal and Healthcare. The continuous coverage on the healthcare system in the news sees this industry being the most stressed as no surprise. Receiving similar coverage in the news is education, which comes in as the sixth most stressed industry, with news on the increasing pressure teachers are enduring especially. With these tips in mind, it’s time the nation put more focus on reducing stress levels, and allow people to live with healthier and happier lifestyles. “Stress is something that affects us all at some point or another in our lives, but it’s surprising to discover just how stressed we are as a nation and the main causes of these feelings.